We invite you to experience the Carolina sandhills tucked away minutes from the Las Vegas Strip in the historic part of Las Vegas. As you begin your Vegas golf round at Desert Pines Golf Club, you will feel transported from the closed-in casinos and overpowering glitz to a place where you can enjoy the fresh, cooling, calming scent of real pine trees. This Dye-designed Las Vegas golf course features more than 4,000 mature pine trees lining the fairways with green grass running from tees to pins. White sand bunkers protect large, undulating, bent grass greens fashioned after those at Augusta National Golf Club. Although there are no forced carries, four lakes will add to the excitement and beauty of your round. Desert Pines is often referred to as Las Vegas' "Top Strategic Course" and is conveniently located less than five minutes from downtown and less than 15 minutes from the Las Vegas Strip. The best of Vegas golf, Desert Pines was recognized as one of the best upscale courses in the country by Golf Digest and was selected as a host course by The Golf Channel for the very popular Big Break II. The AEA’s 32nd Lowell Gaylor Memorial Golf Tournament will take place on Sunday, March 24. The first 144 participants will be guaranteed a slot in the tournament. The advance registration fee of $85 includes green fees, cart, pre-round range balls, breakfast treats and snacks at the conclusion during the awards ceremony . . . plus a $10 donation to the tournament founder’s memorial scholarship fund. This tournament utilizes a shotgun format with a scramble-type play and scoring system. 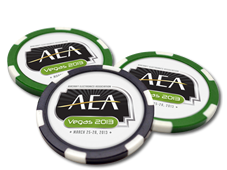 This tournament is open to all AEA convention attendees. Foursomes will be selected from a random drawing. No requesting teams please... this is a great way to get to know other AEA members! Check with the AEA for any remaining openings at 816-347-8400. Deadline for a guaranteed slot at the rate of $85 per player is February 22. No refunds for cancellations received after February 22. The registration rate after February 22 is $125 per player. Golf Hole Sponsorships Available / $650 - includes one golf registration. If your company has hats, towels, tees, golf balls, etc. with your company logo, we would be glad to put them in the golfer’s goodie bags. Please contact Debra McFarland at debbiem@aea.net or 816-347-8400 for further details regarding the goodie bags. Call the AEA for any remaining openings at 816-347-8400. Departs the MGM Grand main lobby entrace at 6:45 a.m. on Sunday, March 24. Pickup at Desert Pines Golf Club is at 1:45 p.m. Cost is $15 per person - CASH ONLY!